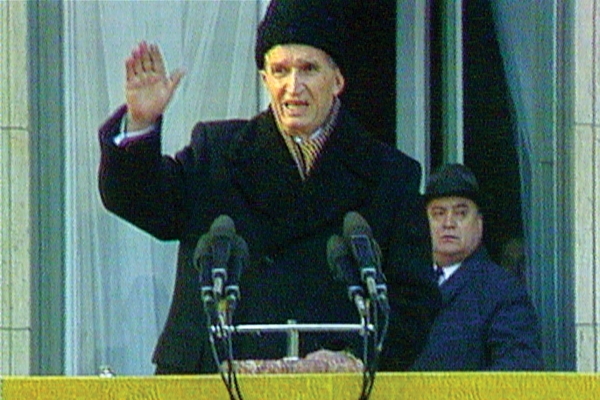 Andrei Ujica begins and ends his film The Autobiography of Nicolae Ceausescu (2010) with the same scene: it is December 1989, and a shaky, handheld video camera records the president of Romania and his wife, Elena, as they sit behind a small table in their overcoats, responding with exasperation to the accusatory, largely offscreen voices of those who have arrested them. 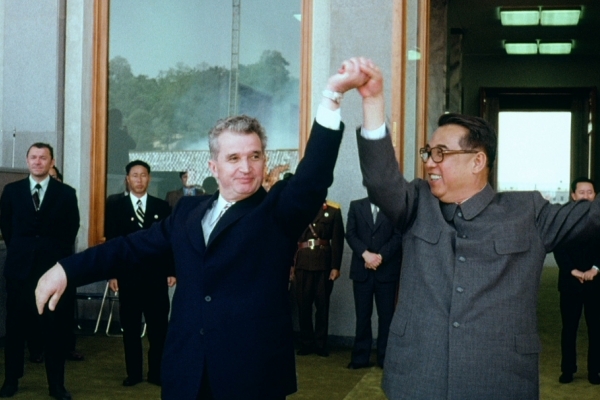 "Whatever your masquerade is," Ceausescu begins, but he is cut off: "It was your masquerade for the last 25 years!" From elsewhere in the room, the interrogators provoke and interrupt their captors, asking questions then immediately silencing them with more accusations. "I'm not making a statement except to the Grand National Assembly," Ceausescu finally states with an air of haughty indignation. "I'm not answering, and please don't take this as an answer." Bookending his compilation film of footage from Ceausescu's reign as head of state with this scene, Ujica returns the spectator to a familiar historical spectacle: the decisive moment in the Romanian revolution of 1989, a widely televised uprising that resulted in the hasty trial and execution of Nicolae and Elena Ceausescu. It is just this scene that ends Ujica's 1992 collaboration with Harun Farocki, Videograms of a Revolution: after several days of gathering in the streets capturing images of the revolution with video cameras of their own, the people of Romania gather around the television to find confirmation in the single image of the Ceausescus' lifeless bodies. These films, along with Out of the Present (1995), form a loose trilogy through which Ujica reconstructs not only the history of the end of communism in Eastern Europe and the dissolution of the Soviet Union, but also the role that media—especially film and television—played in both narrating and shaping it. Videograms, with its dozens of amateur camcorder clips, and Autobiography, comprising three hours of film footage culled from Romania's National Archives, represent mirror images of this period, two opposing histories that convene in the singular but ambiguous image of the Ceausescus in custody. Singular but ambiguous: for even this scene, with all its symbolic finality, represents the kind of political theater of which Ceausescu was a master. Even amid this "masquerade," in which the dictator is finally dictated to, Ceausescu claims the last word with an answer that is no answer. His final, desperate display of power is the right to speak for himself and on his own terms. And the grand irony of this apocryphal "autobiography" is that it's authored by at least two ghostwriters: first channeled through the apparatus of state-controlled media, then in turn subjected to Ujica's détournement. On the one hand, the official images, intended to represent the president of Romania to the people, form a portrait of the larger-than-life "Genius of the Carpathians," complete with lavish parades, bombastic speeches, and official audiences with the likes of Mao, Kim Il-sung, and Richard Nixon, as well as family vacations, birthday parties, and hunting expeditions. But on the other, we also get the tragicomic story of a stocky bureaucrat who descends into egomania and falls hopelessly out of touch with his people. 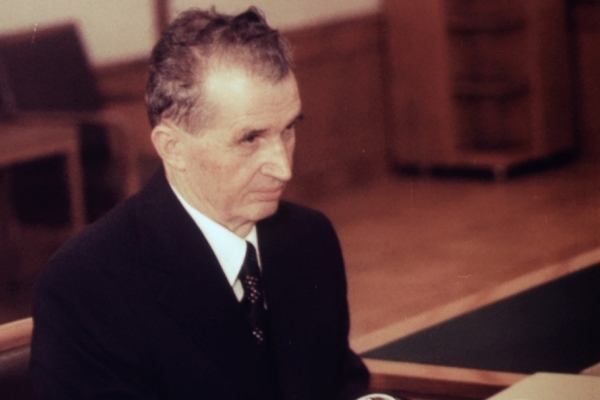 Through Ujica's treatment of the footage (aided by Dana Bunescu, the masterful editor of The Death of Mr. Lazarescu and 4 Months, 3 Weeks and 2 Days), Ceausescu's reign takes on a curiously ambiguous character. Images of the dictator playing volleyball and swimming in the Mediterranean on vacation, or loudly opposing the Soviet invasion of Czechoslovakia in 1968 (a position that drew the admiration of leaders in the United States and Western Europe), support historian Steven Roper's claim that "Ceausescu's regime was neither authoritarian nor totalitarian," like Mao's or Stalin's, but rather more "sultanistic," marked by "a fusion of public and private spheres" rather than lofty claims of divine authority.1 The rather comical images of Ceausescu visiting Mao Zedong in 1971, in which the Romanian president seems almost pitiably uncomfortable in the commanding and austere presence of the chairman of the Chinese Communist Party, seem to bear this out. Despite his later attempts to emulate the personality cults and cultural revolutions of Mao and Kim Il-sung, Ceausescu often seems more deluded than despotic, even in the widely televised images of him strolling around well-stocked supermarkets at a time of widespread food shortages. Whether or not Ceausescu was the victim of his own media manipulation, we finally almost feel a twinge of sympathy for the septuagenarian and his wife, disdainfully awaiting their fate in an obviously chilly institutional building. Ujica took a more nuanced view. In 1990, then an assistant professor of literary and film theory at the University of Mannheim, he quickly edited a collection of essays on media and the Romanian revolution with Hubertus von Amelunxen called Television/Revolution: The Ultimatum of the Images, featuring contributions from media theorists like Paul Virilio. The book caught the attention of Harun Farocki, and the two embarked on Videograms of a Revolution, a film that examines in detail the divergent video spectacle of the revolution: amateur handheld footage taped by ordinary citizens on the sly, the official state-run media that attempted to occlude the growing unrest, and finally the takeover of the central broadcast studio, from which the insurgents declare victory and call for peace: "We are victorious! The TV is with us!" 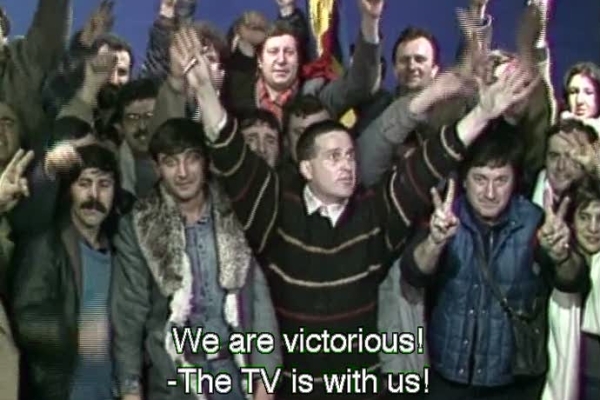 From the beginning of the film, it is clear that cinema itself—and video, in particular—plays a crucial role in these events, not simply depriving Romanians of the revolution as a lived experience by making it "virtual," but shaping it in complex ways. The very first images we see are of a woman lying wounded in a hospital bed. She has been badly injured in the Timisoara protests, but struggles through her pain to speak to the camera, demanding to know that the camera is recording both image and sound. For her, video is the medium that will bear witness to history, reveal what has been hiding behind the state's official media imagery, and give voice to those who have not been able to speak for themselves. As Ujica stated later, in an interview with Mark Peranson for Cinema Scope, "I understood that something important was happening in the mode of recording history and that now we could deal with historical documents in an intimate and direct way that we couldn't before." For Ujica, video's "mobility, the possibility to get into private spheres with smaller cameras much more easily" enabled a new form of historiography to counteract the kind of univocal spectacle that characterized the Ceausescu era. This technologically liberated perspective takes on literally cosmic dimensions in the middle film of the trilogy, Out of the Present. 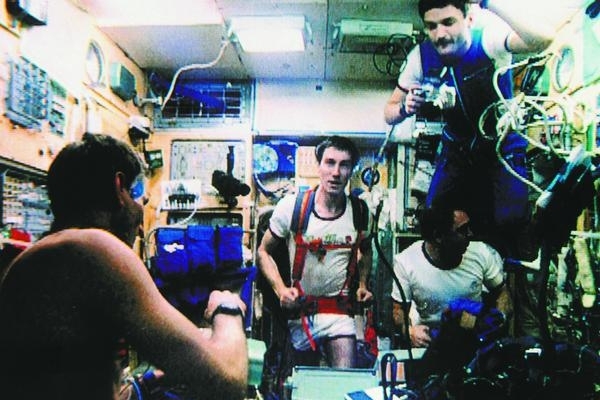 Again relying on archival footage—along with a few wry film clips and some elegant shooting of his own—Ujica tells the story of cosmonaut Sergei Krikalev, who set off from the Soviet Union for the Mir space station in May 1991 only to return to the newly formed Russian Federation some 10 months later. Three months before his return, Gorbachev gave way to Yeltsin, and Leningrad was again St. Petersburg. As the last citizen of the USSR, Krikalev occupies a unique position from which to view historical change: out of the present, outside of time, history, and politics, in his own temporary autonomous zone. Set between the two Romanian films, Out of the Present concerns the writing of history not only by television and state media, but also through science fiction films. With its ironic references to films like E.T., Dr. Strangelove, and especially 2001: A Space Odyssey, the film might be, as Paul Virilio has it, "about the invention of outer space by military technoscience, tied to the balance of terror between the East and the West." But while playing with the cultural imagining of outer space as itself a product of the Cold War, Ujica also gives us Krikalev's perspective on a totally deterritorialized globe, with no visible people, borders, or political ideologies. With a direct quotation from Tarkovsky's Solaris, Ujica cuts the final aerial shot of the simulacrum of Kris Kelvin's father's house together with a similar shot of the earth's topography viewed from the Mir, suggesting that Krikalev's liberated, cosmic perspective might itself help to create new landscapes on the surface. As Ujica explains, "For the first time a human being had the possibility to look down at the end of a period of history on earth like the gods from Homer's Olympus." Camera and event. Since its invention, film has seemed destined to make history visible. It has been able to portray the past and stage the present. We have seen Napoleon on horseback and Lenin on the train. Film was possible because there was history. Almost imperceptibly, like moving forward on a Moebius strip, the side was flipped. We look on and have to think: if film is possible, then history too is possible. 1. Steven D. Roper, Romania: The Unfinished Revolution. Florence, KY: Gordon & Breach Publishing, 2000: 50. 2. Jean Baudrillard, "The Timisoara Massacre," in The Illusion of the End, translated by Chris Turner. Stanford: Stanford University Press, 1994: 56. Leo Goldsmith co-edits the film section of The Brooklyn Rail and is a PhD candidate in the Department of Cinema Studies at New York University. He contributes regularly to Not Coming to a Theater Near You and Reverse Shot.